Living in Brisbane, Aaron had the opportunity to target a huge range of species over the years, from Bream to Marlin and everything in between. 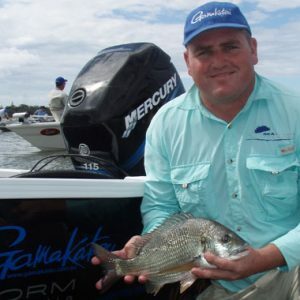 His love for Bream fishing led him into the tournament scene and he now owns a dedicated bream and bass tournament boat, a Champion with 250 Pro XS Mercury. And he has a particular soft spot for surface fishing where the thrill of seeing a fish track his presentation, then smash it off the surface gets him revved up. On top of the fact it is the most exiting way to fish, he believes this style of fishing often gets the kicker fish in any comp. It doesn’t get any better than that!! At the top of the list, Bream is the species he targets most, and was the first fish caught as a child fishing with Sharpey Snr. In those days it was with bait off the beach, and occasionally in the boat but these days it’s all about Bream on lures. Aaron believes bream can be incredibly smart and difficult to catch, which makes working out a pattern and catching great fish very satisfying. His PB bream of 46cm fork length was taken in Moreton Bay on a Megabass Dog X surface lure which explains his love for this form of fishing. Picking a favourite lure is easy. Atomic cranks (ie ‘Bream Candy’) are his go-to lure, and have caught him countless great fish. Ridiculously easy to use, a long cast and slow wind will get bites from any bream in the area. He has been tournament fishing for 7 years now (far too long if you ask his wife!!) and he still loves the competition, excuse to go fishing, and chance to catch up with mates met over the years. When he isn’t fishing, Sharpey is hanging out with his wife Megan and son William, fixing team mates’ boats (mainly Tristo’s), or working as a Sales Rep for the family business, Sharp Plywood. Sharp Plywood has been a family run business for 65 years, and can help you with all your plywood needs.